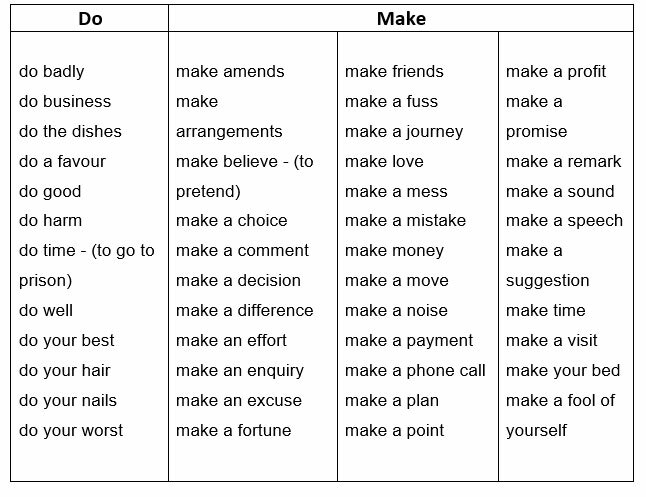 MAKE is associated with creation (producing, constructing, creating or building something new, plans and decisions). We use Make with food, drink, meals. I've just made a cake. Can you tell me how much ten and ten make? The dress you are wearing seems to be made for you. DO is associated with completion (about work, jobs, tasks, activities in general without being specific). They do not produce any physical object. We sometimes use DO to replace a verb when the meaning is clear or obvious. This is more common in informal spoken English. I must do the shopping. You must do your exercise again. My boss is fond of doing business.